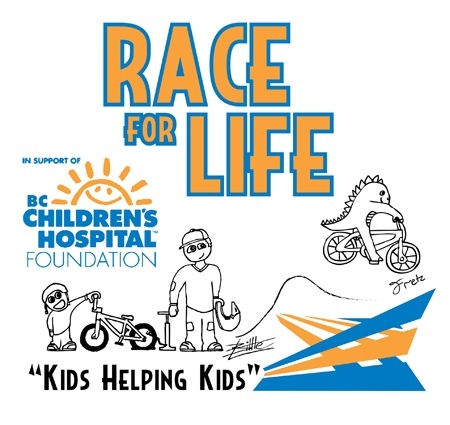 The Race For Life is a charity race event where riders and parents fund raise to gather donations for BC Children's Hospital Leukemia Cancer Research. It's all about kids helping kids. All proceeds from the entry fees will be sent to BC Children's Hospital Leukemia Cancer Reserch. Riders can also collect funds before and after the race and receive special prizes provided by BMX Canada and North Shore BMX, based on the amount collected. Tracks earn the privilege of double point status for their 2018 Race For Life by attaining a $1,500 donation goal this year. To date, BMX Canada tracks in BC have raised over $400,000.00 and they raised $41,547.89 in total during the 2016 BMX race season! Help us beat that number this year by supporting the Race for Life by riding & fundraising or supporting a local rider! Check out the video presentation of 2014 donation at the Fraser Valley Nationals in the spring of 2015! We are hoping to see lots of riders and families from our track participate this great fundraiser. We are having our Race For Life Race on Wednesday, August 7th. But we are accepting any donation up until Saturday, August 5th. Please pick up your collection envelope at the Registration or you can donate/collect donations online if it's easier for you. 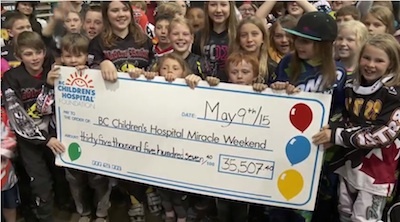 In 2012, BC tracks sanctioned by BMX Canada liaised with BC Children's Hospital and initiated an online system where people can donate online and anyone can see online how much each club is raising. IF YOU JUST WANT TO DONATE, click "DONATE NOW" blue button. ​Please ask people if they want a Tax Receipt when you collect donations. Tax receipt will be issued directly from BC Children's Hospital. Please write down thier Full Name or Comapny Name, Full Address, Phone Number and Amount Donated on the Tax Receipt Sumary sheet attached to the collection envelope. Pleaes note that we can't get them tax receipts without the above information. If you are collecting donations online, the tax receipt will be provided online at the time of donation. Come and race BMX and support a great cause!! This event is open to members & non-members, anyone/any age interested in trying out BMX. Bring your families, friends and neighbours to try out our beloved sport of BMX, the newest Olympic cycling discipline!! To Non-members, if you are under 18, your parents need to sign a waiver.